Scouting is the key to waterfowling success. It's important to call during the right time but more importantly, in the proper location. Close, but no cigar. A large flight of ducks appeared on the horizon like a waving ribbon of tiny black dots. Gradually the dots got bigger and turned into birds. Eventually the ribbon formed into a loose flock of mallards and in the early morning light each bird could be seen jockeying for position. This was a sure sign that these birds wanted down, so we reached for our calls with one hand and a shotgun with the other. When the birds were about 400 yards out we hit them with a chorus of high balls and excited greeting calls. Immediately the flight of mallards responded and locked onto our location. What looked like to be easing pickings, turned out to be the total opposite. A couple hundred yards out, the birds started flanking our position in favor of another destination. Pleading but unsuccessful comeback calls left us wondering what went wrong. The birds slid into a back bay a couple hundred yards down the lakeshore. We watched in amazement as they splashed down safely away from our decoys and guns. Moments later the whole scene played over again with similar results. It wasn't long before more birds appeared and followed the same flight path. I looked at my partners, they stared back and we all knew what had to be done. No one wants to move six-dozen decoys, especially at prime time when ducks are flying. Unfortunately, it was obvious that the location we settled on wasn't going to get the job done. Every flight that came by that didn't commit to our spread was another lost opportunity. Every duck hunter has had the frustrating experience of watching birds pitch down within sight, but not shotgun range. The best decoys, skillful calling and perfect concealment are all great hunting assets, but none of these things will pull birds away from the areas they want to be in. Waterfowling success depends on location. Unfortunately, the perfect location that guarantees success is almost as fleeting as the birds themselves. Often the most productive spots change every day and some times they change from hour to hour. Hunting spots are not the only things that change in waterfowling. Changing weather is the culprit that is most often blamed for a hot spot going cold. Hunting pressure also turns good bets sour. The blame for waterfowl hunts that go astray is many, but one factor in particular always takes the lead--inadequate scouting. This leaves more gun barrels cold than unpredictable weather, hunting pressure and other excuses combined. Being consistently successful requires the knowledge of knowing where the birds are feeding, resting and the travel routes they take in between. Achieving this often-overwhelming goal is no easy task. The areas birds favor are constantly changing and the only way to keep up on these changes is to scout more often than the next guy. "The task of scouting large hunting areas is overwhelming," says Thornton. "We divide up our hunting area into four pieces and designate a different individual to scout each piece of the pie." Each evening during hunting season Thornton and his partners meet to discuss the birds they've located. "When it comes to selecting a hunting area we're looking for two important ingredients," explains Thornton. "Our goal is always to locate large concentrations of birds, but we also prefer to hunt birds we've watched for a few days to make sure they are using an area consistently. Often a group of birds that are feeding in a large field today will for no apparent reason move to another part of the field or a nearby field the next day. To ensure hunting success you have to know not only the field the birds are feeding in, but the exact 'spot on the spot' the birds want to use." If you make all the right scouting decisions, you'll have plenty to shoot at when the time comes to pick up the shotgun. It's usually impossible to pin down the "spot on the spot" without actually walking or driving out into the field and looking for droppings and feathers on the ground. "We wait until the birds leave the field in the evening to return to their water roosts, then we move in for a closer look," says Thornton. "Geese tend to pick high spots in the field where the stubble is lower and the birds can better see approaching danger. Both ducks and geese typically feed right on the strips of waste grain left behind by the combine." Thornton drives a stake in the ground to mark the exact location in the field the most birds are using. The next morning he sets up a few hundred yards away and watches with binoculars to see if the birds land on his stake. If the birds cooperate, they plan a hunt for the next day. Anyone who has spent much time scouting waterfowl has no doubt wondered why certain fields attract hungry birds while other seemingly identical fields do not. The answer isn't as simple as food type. 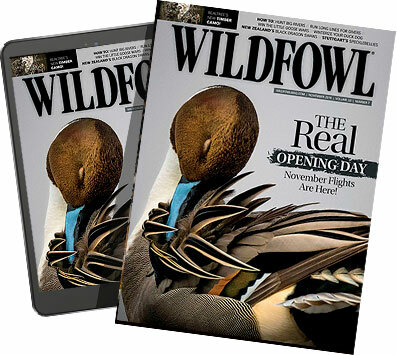 "I feel the location of the field in relationship to roosting water is more important than what type of food is available," says Randy Lewis of Lewis Outfitters in Manitoba. "Ducks and geese will eat a wide variety of agricultural crops, but they don't like to travel far from their roosting areas to feed. Ducks will usually travel no more than three to five miles to find food and geese rarely travel more than 10 miles from a favorite roost site to find feed." The best fields tend to have two things in common: Fields that are located close to roosting water, and those fields that feature lots of waste grain attract the most birds. "Grain crops should be harvested soon after ripening," says Lewis. "The longer these grains set in the field the more ripe they become and the more waste grain that results when they are harvested. The entire heads of wheat, barley, oats, peas and beans will often break off and fall on the ground if the crop is too ripe. Waste grain like this makes it easy for ducks and geese to fill their crops quickly." Jan Ehlert is a Michigan based hunter who has won many calling contests and competed at the World Duck Calling Championships five times. Ehlert travels frequently to hunt and his first emphasis when visiting new areas is always on scouting. "Duck hunting is a classic example of how you can strike out amidst plenty," says Ehlert. "Even in areas where there are tons of birds, it's critical to know which potholes, backwaters or other bodies of water are likely to attract the most birds." Making a commitment to scouting is how you stack the deck in your favor. "When I'm hunting puddle ducks, I prefer to hunt small bodies of water the birds have been using as overnight roost sites," says Ehlert. "If possible, I avoid large waters because approaching birds often survey your decoy spread, then sit down outside of gun range. This is especially common among birds that have seen a lot of hunting pressure. On a small pothole, pond or stock dam, the odds are much greater that approaching birds will either land or provide close-in shots over the decoys." Concentrating on roosting waters is a good way to ensure success on early morning hunts. "I like to arrive a little before legal shooting hour and flush the birds off the pond," adds Ehlert. "Once the birds leave you have to work fast. Take note of the wind direction, pick a good hide that works with the wind and get your decoys set as quickly as possible." Once you've scouted the ideal location, the next move is to canvas the area with dekes. The action when hunting roosting waters is early and fast. "Once your last bird has been taken, pick up and get out of the area quickly," advises Ehlert. "Leaving the area immediately allows other birds to return to the pond without being educated. If enough birds are using the pond, it might produce another good hunt after a day or two of rest." Unfortunately not all the ponds that attract birds are good roosting waters. "Often birds will feed on certain ponds but spend the night on others," says Ehlert. "If a pond is only attracting a dozen or so birds, chances are this is a feeding or loafing area. Ponds that hold 100 or more birds are dependable roosting waters." Ehlert finds his daily hunting spots the old fashioned way. "After my morning hunt, I spend most of the rest of the day driving back roads and glassing for pockets of water with birds on them. It never hurts to visit with local conservation officers, mail carriers and others who spend a lot of time in rural areas. "I once got a great duck hunting tip from a lineman who was working on a substation miles from the nearest town," explains Ehlert. "We stopped, offered the worker a cold soda and started talking ducks. It wasn't long before he had outlined on our map half a dozen spots to try." Scouting is important even if you're hunting familiar areas. The day-to-day movements of ducks are unpredictable at best. Having "fresh" hunting information is the way to keep your edge. This is especially true among hunters who frequent managed public marshes. Public waterfowl areas often designate blinds through daily drawings. Hunters who frequent these areas are not only dealing with the unpredictable nature of waterfowl, but also hunting pressure that impacts on virtually every blind available. These managed areas are normally set up to offer both a morning and evening hunt daily. Hunters are required to register the birds they harvest at the area check-station. Studying the daily kill statistics is the best way to zero in on the most productive blinds. This kind of scouting can be conducted from an easy chair over a cup of coffee. By studying the kill reports for several days, patterns can be determined. Referencing this information against weather conditions makes it possible to develop an educated guess as to which blind locations will continue to produce. Dramatic changes in weather shuffle the deck, but those hunters who have witnessed these changes before can still make amazingly accurate predictions as to which blinds will produce. Guys with this kind of experience aren't likely to share their hard won information, but you can figure it out yourself by simply keeping notes on weather conditions and which blinds seemed to produce best as a result. Over time, a clearer picture will develop that can refine your scouting efforts to the expert level. Hand-held radios are a great time saver when two or more hunters are sharing the scouting chores. The distance personal radios can be used depends on the quality of the radio, antenna system and the terrain where they are used. Most will start to lose a signal after only a mile or two. Some of the better quality models will hold a strong signal out to about five miles. All hand-held radios transmit and receive along a line-of-sight pattern. The higher the radio is held in the air, the farther the signal can be clearly transmitted or received. Keep this in mind when using the radio. Try to broadcast and receive messages when on the top of hills or ridges if possible. Avoid trying to communicate in low areas or when behind hills, tall timber or other disturbances that can break up the radio signal. Quality binoculars are essential scouting tools. At four hundred yards what appears to be a big flock of ducks to the naked eye can easily be identified as a bunch of coots with binoculars. Optics can also help differentiate between species such as diving ducks or puddle ducks making it easier to target desired species. Since you won't be carrying the binoculars long distances, get a pair that feature large objective lens. A good starting point is 40mm lens, but 50mm lens do an even better job of gathering light. Models that feature an 8X, 9X or 10X magnification are ideal. reas you are going to need a little more help. The more remote the area you're hunting the less likely you'll be able to find road signs or markers to guide you back to birds you've located. An inexpensive hand-held GPS unit is a great tool for saving the location of potential hunting spots. Most of these units can be purchased with a windshield or dashboard mount that makes them easy to read while driving. The name of the game is to find them, but not to spook them. You'll have to get close enough to identify species, evaluate potential blind locations or note spots where the birds are seemingly more concentrated. Don't bust the birds from the area however. Birds that are getting gunning pressure will often take wing the second a vehicle stops. If this happens, slow down to watch the birds, but keep moving to avoid busting them. Waterfowl hunting isn't like horseshoes. Close isn't good enough. To be successful, your hunting and blind locations have to be in the places the birds want to be. It's true that spending time scouting takes away from potential hunting time. But the benefits of scouting far outweigh the "try and see" approach. With the right tools and attitude, scouting is as much a part of the hunt as the decoys, guns or calls.